TATTOOS: First Tattoo: Tips on breaking your tattoo cherry. So as you may have seen I’ve been on a tattoo collecting mission over the past few days so I thought I’d share my tips and advice on getting that first tattoo. Since the age of 18 I have had my fair share of tattoo studio encounters, and although the rules will vary from studio to studio, and you should always discuss any concerns with them specifically, this guide should see you through your first tattoo, and ease a little of the nervousness, keeping you prepared and happy. My first tattoo was on my 18th birthday at a local studio, Woody’s Tattoo Studio in High Wycombe, Bucks. I had a swirly black ‘R’ on my ankle that I designed myself. I literally walked in, booked an appointment for later that day, and had it done. The studio sang Happy Birthday to me as well. To be honest, it was a fabulous start to my tattoo journey. So hopefully at this early stage you have your design in mind. Or at least an idea of what you would like. Now you need to find a tattooist. This is pretty important. The last thing you want or need is a bad tattooist for your first tattoo. Or worse still, your best mates, friends cousins boyfriend, who will do it in his kitchen , which is ‘super’ clean. 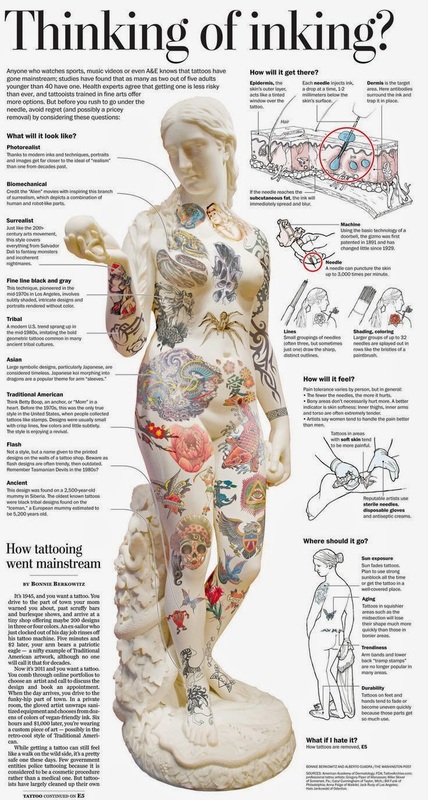 To find a tattoooist couldn’t be easier in this day and age. Tattoo magazines advertise the very best in the business, and most artists and their studios will have Instagram pages, plus Facebook and twitter accounts. And not forgetting the old classic, word of mouth. I have sent at least two people know to Lee Smith who did my back, foot, and right sleeve, and another to Saranna, who did my left lower sleeve and base of my neck. The power of word of mouth is still incredible even now. Because people just won’t recommend another person if they are bad. Now you’ve found your tattooist, go meet them, or at the very least message them with your idea. They can then book you a date and time, and advise if your design is viable, what they want to do with it and what to expect. You also need to consider placement. As a first timer, you will probably want somewhere you can cover up, and a less sensitive area too. Stay away from ribs, it’s a tough spot to sit through generally speaking. Your tattoo inspiration if the artist is designing on the day. High sugar food, chocolate is good – personal must is jaffa cakes. A banana or cereal based item, for a longer lasting sugar boost, especislly if you are going for a longer session or are prone to sugar imbalances. Drink – personally I go high sugar with lucozade or cola. Reading material/tablet – to keep you entertained and not fidgetting. A friend – check with the studio first on their rules, but most will allow one friend to attend for moral support. So the big day has arrived. Make sure you eat an hour or so before you get to the studio, to give yourself that much needed boost. Get yourself to the studio on time. Remember time is money. For you and them. "TATTOOS: Does your tattoo have to have meaning?" Thank you for this post! My best friend and I are planning on getting our first tattoo together soon and this was really helpful. Even though the design is extremely simple, finding a good artist is kind of stressful! This is excellent! I've already got five but wasn't aware of some of the suggestions. Might help me to get hubby in to get a tattoo yet! !